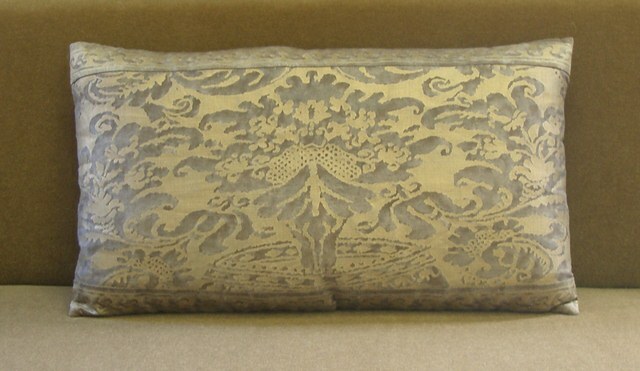 Presenting a lovely 18th century Flemish tapestry pillow. Central urn filled with roses, tulips and peonies with foliage in blues and greens on a gold background. Tapestry is bordered with late 19th century gold metallic trim and finished with gold silk and gold metallic cording. Back is modern silk velvet in cobalt blue. 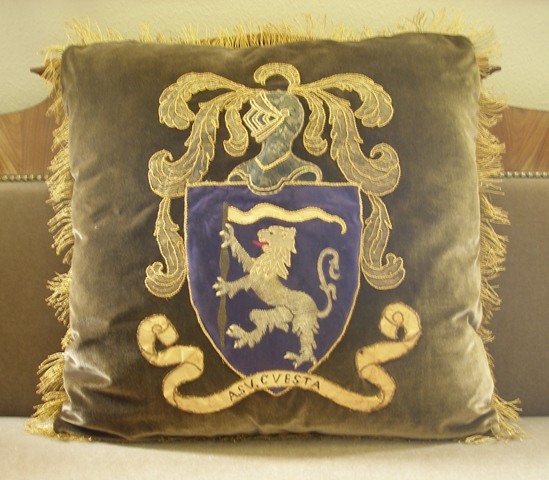 19th century German Coat of Arms Pillow. Hand couched to a modern bronze colored silk velvet. The crest has a rampant Lion worked in gold metallic threads and bullion on a blue velvet ground, carrying a banner. Above a knights bust worked in silver metallic cloth of silver outlined with gold metallic cording. Below scrolling banner marked A. CV. CVESTA. Finished with 19th century gold metallic fringe. Back is matching bronze silk velvet. 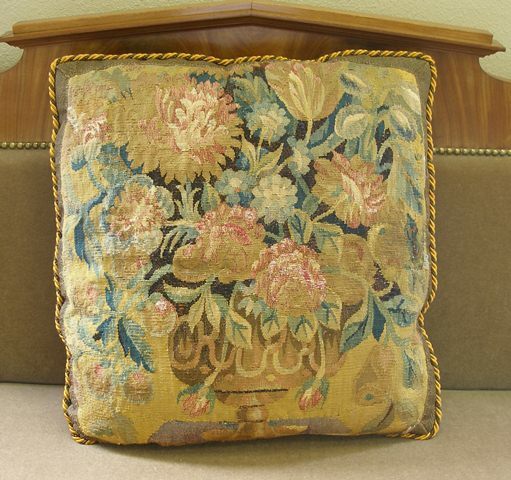 Vintage 1980's Fortuny Canestrelli pillow. 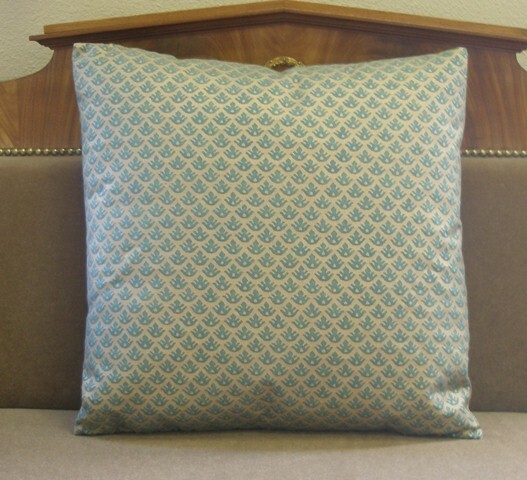 Canestrelli pattern 16th C. Design named for Venetian Shell - Persian Influence. Green and Silvery gold color way. Simply finished with modern gold silk with green undertones. Corone pattern 17th C. Italian Design - Crown motif. Gray and Silver color way with silver metallic overlay. Finished with Fortuny border flange with scrolling "R" pattern. Corone pattern 17th C. Italian Design - Crown motif. Gray and Silver color way with silver metallic overlay. With border above and below. Simply finished backed with gold silk..